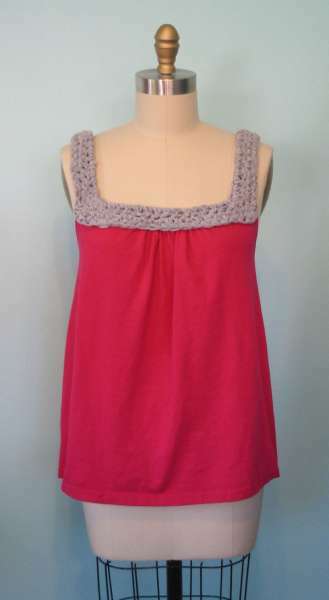 FIRST YOU TAKE A …………..THEN YOU CROCHET A ……..
Dolin O’shea has a nice tutorial about making tee-shirt yarn and using that to re-fashion a cute tank top. Using these same ideas, you can re-fashion any number of otherwise throw-away garments into ones you can wear and enjoy. Want capris or yoga pants? Take a pair of thin sweats or other lightweight knits and cut off at the length that’s right for you. Edge with a cute row or two of crochet. Have a tank that your kid has outgrown? 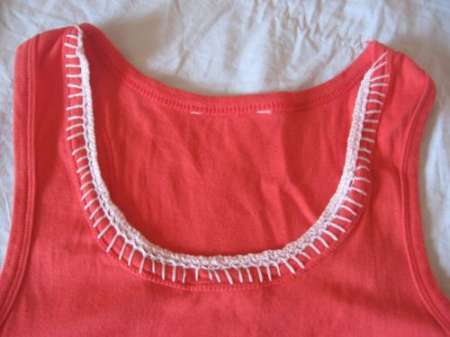 Take it and a piece of fabric or the skirt from a different dress, and crochet them together to create a new dress. These ideas will save you money, create a look that’s unique, and soothe your creative urges. Go for it. Not much to lose. 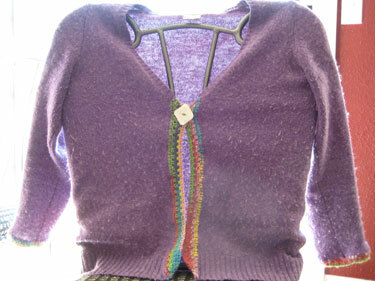 What great and simple ways to re-purpose old clothing! I’ve actually got a bag of stuff going to goodwill right now, I think I’ll have to go through it and see if there’s anything I want to keep to try your ideas out on. Thanks!